Finally got round to drinking this beer, its been in the fridge for months. This beer completes the set of having a beer from each Trappist brewery in it's glass! So it's quite an exciting day, however this section will continue as I sample different beers from the 7 breweries, or if as rumored Engelszell Stift or the Abbey of Zundert get their breweries up an running in the near future. So Trappistes Rochefort 8 is the highest rated Dubbel on all of the big beer rating sites, it's quite rare for one beer to lead all of them for any particular style. That's got me quite excited for this beer! Trappist beers are known for having some whacky ingredients, however this beer has got one of the stranger ones I've ever heard of; coriander! Despite the coriander mixed in with what is otherwise quite a normal sounding trappist beer, let's do this! There is something about the shape of trappist beer glasses that make them quite hard to photograph. Anyway the colour is a dark reddish brown, with some noticeable sediment swirling around the glass. An off-white to brown head sits on top of this beer and has excellent retention, when the head finally subsides it forms a small ring around the glass however it leaves minimal lacing. On a side note, this is one of the best beer glasses to pour a beer into, the angles are just perfect! If the smell is anything to go by this is going to be a sensational beer! There are lots of flavours in ample quantity on the nose and it's quite complex. Firstly the whole beer smells lightly spiced, this adds a warming quality to the beer that is enhanced by little wafts of alcohol throughout. 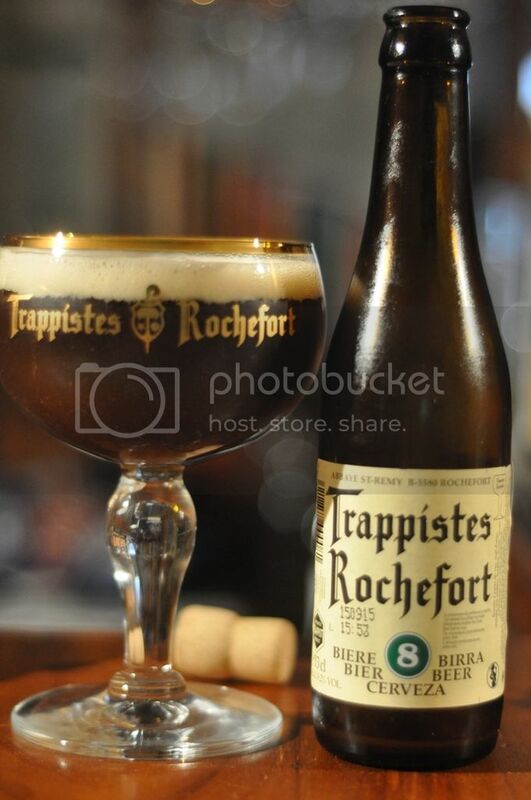 Trappistes Rochefort 8 has the standard roasted malt flavour that most trappist beers have, as well as loads of dark fruit aromas. I can easily identify a cherry like aroma and some figs or dates as well, this beer has a brilliant nose! This beer has one of the nicest mouthfeels of any beer I've had with this sort of alcohol content, and it matches a seriously good flavour to perfection. It's a slightly sweeter version of a dubbel, with lots of caramel malts with tastes of sweet bananas and also of figs and cherries. There is some evidence of candied sugar but not enough to disguise a small bitter taste. This bitter taste is not unpleasant but neither is it appealing and it's attempts to balance what is otherwise a sweetish beer is somewhat unsuccessful. It's still a lovely tasting beer. I'm really impressed with this beer. For a dubbel it has quite a high alcohol content, 9.2%, and this would make it quite hard to drink many of them. However the low-moderate carbonation help it's drinkability and the flavours are simple sensational. As a one of drinking experience, it's certainly a good one! I think that this is one of the less approachable trappist beers and is probably one for the more experienced trappist beer drinker.